At Strip’s we appreciate our partnerships with world-known design-effective companies that are committed to innovation through design. We recognize the importance of design for good business and cooperate with leaders in design and innovation to enrich the goals of our partners and contribute knowledge and expertise to community development and the improvement of quality of life. Strip’s is a part of the LED Light global network organised by OSRAM. We passed through a strict certification process and we granted a Certificate, with which we guarantee you the highest level of quality and professionalism in general lighting projects and services at anytime. We also develop strategic cooperation with universities and laboratories, as well as a number of organizations and development agencies. We thank the following organizations for supporting this work and sharing our vision of designing a better world through industrial design driven innovation. 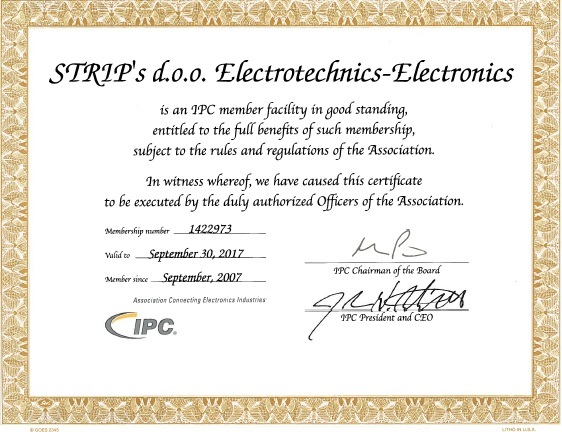 We are part of IPC organization (Association Connecting Electronic Industries) as IPC Member.